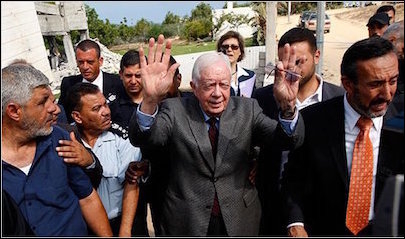 Perhaps sensing that he would soon have to relinquish his position as America's worst ex-president, Jimmy Carter reminded everyone last month how he earned the title with yet another call for the U.S. to recognize a Palestinian state. Carter's call is a departure from American diplomacy, which insists, per UN Resolution 338, that an Israeli-Palestinian peace agreement can only be reached through negotiations "between the parties." Carter's presidency was mired in bad foreign policy decisions, and his post-presidency has been marred with excusing terrorism, attempting to revise history, and meddling in the affairs of every subsequent occupant of the White House – especially where the Middle East, which Carter considers his forte, is concerned. At each stage of his post-presidency, he has advocated on behalf of the Palestinians and against Israel, a nation he considers an apartheid state. 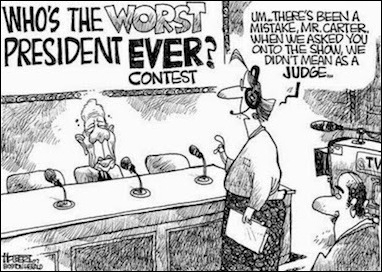 The Carter presidency is notable mostly for its failures: a 21.5% prime interest rate, the aborted April 1980 mission to rescue American hostages held in Iran, and dreary speeches to the nation, like the "crisis of confidence" or "malaise" speech. The only bright spot, and the one achievement upon which he has built his post-presidency reputation, is the Egyptian-Israeli peace deal known as the Camp David Accords. Were it not for that lone foreign policy success during his presidency, few would listen to Jimmy Carter today. At each stage of his post-presidency, Carter has advocated on behalf of the Palestinians against Israel. Unfortunately, Carter gets too much credit for Camp David. He almost botched the whole deal with two ill-advised strategies: bringing the USSR into the negotiations and insisting on a comprehensive deal that would create a Palestinian state. Egypt had been moving out of the Soviet orbit long before Camp David. Egyptian president Anwar Sadat wrote in his autobiography: "I wanted to put the Soviet Union in its place... to tell the Russians that the will of Egypt was entirely Egyptian; I wanted to tell the whole world that we are always our own masters. Whoever wished to talk to us should come over and do it, rather than approach the Soviet Union." In a secret meeting on September 16, 1977 in Morocco, Israeli Foreign Minister Moshe Dayan and Egyptian Deputy Prime Minister Hassan Tuhami conducted the second round of negotiations, without the assistance or even the knowledge of anyone in the Carter administration. At that meeting, Tuhami told Dayan that Sadat "do[es] not wish to be in touch with the Soviet Union, but only with the U.S."
The other flaw in Carter's plans was his attempt to involve the Arab states in a deal that would create a Palestinian state, even after Sadat made it clear that he was pursuing a bilateral arrangement with Israel. Sadat told the American ambassador in Cairo that the negotiations "are getting lost in the papers," meaning the process Carter was cooking. A few weeks into his presidency, Carter spoke about the Palestinians in a way that no previous U.S. president had ever spoken. Abandoning the positions of every prior administration since Harry S. Truman's, he said: "There has to be a homeland provided for the Palestinian refugees who have suffered for many, many years." Jimmy Carter had nothing to do with the defining moment that made bilateral Israel-Egyptian negotiations possible. Though contrary to U.S. official policy at the time, Carter even reached out secretly to Yassir Arafat, only to be snubbed by the PLO leader. Carter's two errors converged when U.S. Secretary of State Cyrus Vance and Soviet Foreign Minister Andrei Gromyko announced a return to the 1973 Geneva Conference in a joint statement. 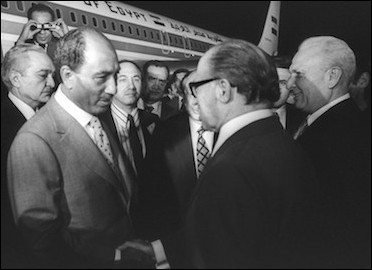 An incensed Sadat rejected the call and soon made his own historic trip to Israel. It was the defining moment that made bilateral negotiations possible, and Jimmy Carter had nothing to do with it. In Washington there was a sense of disarray and surprise, because Carter and Brzezinski were particularly immersed in getting to Geneva. The administration had not been consulted, and the American game plan was thrown out of kilter. Sadat went to Israel, breaking what Stein calls "the Arab psychological barrier by recognizing the existence and legitimacy of the Jewish state. Menachem Begin soon made his own historic trip to Egypt and the peace accord they eventually signed in 1979 bowed neither to Carter's comprehensive negotiating formula nor to his demand for a Palestinian state. It is no accident that Begin and Sadat were co-recipients of the Nobel Peace Prize in 1978 -- the year before the Egyptian-Israeli Peace Treaty was signed. The brave actions each man took paved the way for the treaty. Jimmy Carter, whose advocacy for a Palestinian state almost made the treaty impossible, got his Nobel Peace Prize in 2002 -- largely because a politicized Nobel Committee sought to reward him for undercutting George W. Bush's response to 9/11. Carter left office convinced that he could have brokered a comprehensive Arab-Israeli peace settlement. Carter came into office believing he could personally arrange an Israeli-Arab peace deal. After losing his reelection bid to Ronald Reagan, he left office convinced that he could have finalized a deal in his second term, and has been, in Asaf Romirowsky's words, "practicing foreign affairs without an electoral mandate" ever since. After Hamas won control of the Palestinian parliament in the 2006 election, Carter fretted in the Washington Post that, as Hamas is a terrorist organization, the West would henceforth be unable to distribute aid in the territories and thereby further "alienate the already oppressed and innocent Palestinians." Carter seemed unconcerned that these same "innocents" had just elected a terrorist organization to represent them. Carter receiving a warm reception by Gaza standards, June 2009. In 2014 Carter wrote in Foreign Policy that the West needs to recognize Hamas' "legitimacy as a political actor" in order to facilitate peace in Gaza. Here he was echoing his former National Security Advisor Zbigniew Brzezinski's November 2007 open letter to President George W. Bush urging him to open "a genuine dialogue with the organization." This is the same Brzezinski who suggested in 2008 that a President Obama might order the downing of Israeli airplanes should they cross into Iraqi airspace on a mission to bomb Iranian nuclear sites. Carter needs to ask himself why the world should accept a Palestinian state comprised of the highest concentration of Muslims who believe that suicide bombing is justified when carried out "against civilian targets in order to defend Islam from its enemies." Why should the U.S. accept a nation ruled by terrorists who have repeatedly killed Americans, even when we were there to offer scholarships to Palestinian students? And why should Israel to accept a state on its borders that does not recognize its own right to exist? The world should not confuse admiration for Jimmy Carter's charitable and philanthropic work and joy that he beat brain cancer with the delusion that he was an effective president whose wisdom can see us through troubled times 35 years after he left office.